The bed mattress can mold or can be stained with different things, such as urine, red wine or blood. Sometimes, the mattress can catch a funky smell that isn’t very pleasant nor hygienic for sleeping. 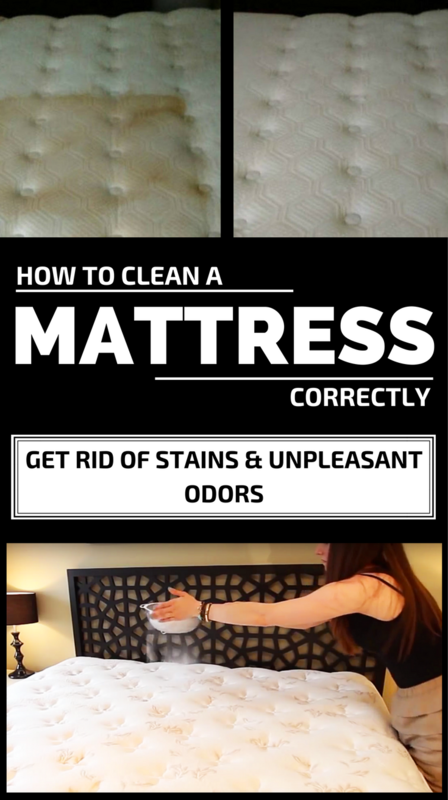 So, learn how to clean your mattress using natural solutions, and how to get rid of the unpleasant smells from it. Before you washing or removing any fiber stains from your mattress, you have to dust well the fine particles, such as food scraps, because sometimes we eat in bed. Vacuum well the mattress on both sides to get rid of all dust particles that causes allergies. If the mattress was stained with blood or urine, you need an organic detergent to decompose proteins and the uric acid from the fabric without ruining it. Don’t use hot water to remove organic stains because the high temperature can cause the stain to get deeper into the fabric. Mix 1 part of cold water with 2 parts of baking soda and dab well the stained area. Once you rinse the place well, let it dry thoroughly, or even use a hair dryer to make sure there is no moisture left in the mattress. You can get rid of urine stains and unpleasant odors with a baking soda, vinegar and water solution. If your mattress has mold stains from various reasons, you have to leave it to dry in the sun for a few days. You can use a warm air fan to speed up the drying process. Mix vodka with lukewarm water and use a sprayer to spray the entire moldy surface. Let it dry out well.